Buying property in NYC on a Temporary Certificate of Occupancy (TCO) can be a risky proposition. The NYC Department of Buildings states that owners should negotiate a closing based on a final Certificate of Occupancy (CO) because if a Temporary Certificate of Occupancy expires and is not renewed, it may be difficult or impossible to buy insurance, secure financing or sell the property. However, many buildings exist by continuously rolling over their Temporary Certificate of Occupancy and banks will lend based on a TCO. Furthermore, buildings built before 1938 aren’t required to have a Certificate of Occupancy at all unless later renovations changed its designated use, egress or occupancy. So just how risky is purchasing a property in NYC that only has a TCO? What Is a Permanent Certificate of Occupancy? The NYC Department of Buildings issues a final, or permanent Certificate of Occupancy once a building has finished renovations or construction and the finished work matches the plans submitted. This is different from a Letter of Completion which is only issued for minor alterations to properties. The permanent Certificate of Occupancy certifies that the completed work complies with all applicable laws and regulations and that all paperwork has been completed. It also certifies that all violations have been resolved and all necessary approvals have been received from various NYC agencies. Furthermore, a permanent Certificate of Occupancy means that all applicable fees owed to the NYC Department of Buildings have been cleared and paid. Why Do You Need a CO? It’s critical to have either a temporary or a permanent Certificate of Occupancy in place. A building is not deemed habitable without one and the city could issue a vacate order at any time if so. The only exception to this are older buildings built before 1938 as we’ve previously discussed. These older buildings can obtain a Letter of No Objection from the city as proof of their compliance with the law. The NYC Department of Buildings may issue a Temporary Certificate of Occupancy if it deems that a property is habitable and safe, even though there are outstanding issues that need to be resolved for final approval. A Temporary Certificate of Occupancy, otherwise known as a TCO, means that a property is safe to occupy but it has an expiration date. A TCO will typically expire 90 days after issuance. Pro Tip: A TCO can be done floor by floor so that certain areas for a new construction building can be finished first and sold even though other sections of a building are not yet safe and habitable. A final or permanent Certificate of Occupancy has no expiration date. In order to get a permanent Certificate of Occupancy, a building must comply with all city codes and zoning resolutions. Examples include the New York City Administrative and Construction Codes, the New York City Zoning Resolution and the New York City Energy Conservation Code. A building must pass a series of inspections of various elements such as the plumbing, electrical and elevator. Once final sign off has been received on all inspections, a member of the Department of Buildings will conduct a final walk-through. 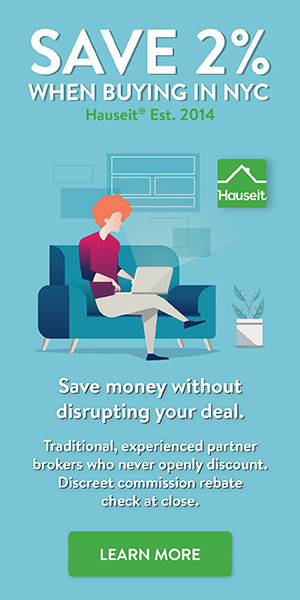 Pro Tip: Are you closing soon on your purchase? Estimate your closing costs in NYC with our industry leading Closing Cost Calculator for Buyer in NYC. Do you need to sell before you can buy? Check out the most accurate and detailed Closing Cost Estimator for Seller in NYC on the web! 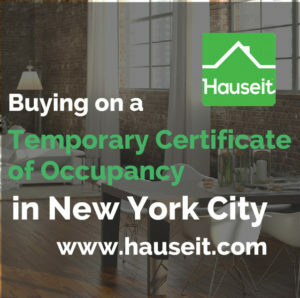 It is possible and common to buy property in NYC when the building only has a Temporary Certificate of Occupancy. In fact, mortgage brokers and banks will regularly lend on only a Temporary Certificate of Occupancy. You may encounter this situation when buying a new construction home in NYC and you are one of the first to close. Or perhaps you are buying a new condominium conversion where one of the owners still has renovation work in progress. The latter is rare these days because most sponsors will include a clause in the purchase contract that prohibits new owners from pulling any permits within the first year. Since you will need a permit from the Department of Buildings to do any renovations, this effectively means you can’t do renovations within the first year. This is necessary because you will need all permits to be closed out and all violations to be cleared to receive a permanent Certificate of Occupancy. With that said, there have been some condominium conversions where the sponsor managed to sell all of the units without ever having received a permanent Certificate of Occupancy. Remember that the Temporary Certificate of Occupancy is only good for 90 days and needs to be renewed. When the sponsor is still in control of the building, the duty to renew lies with the sponsor. This responsibility transfers to the managing agent of the building once the sponsor has transferred control to the new owners. There are many buildings in the city that have never gotten a permanent Certificate of Occupancy and are consistently rolling over to new Temporary Certificates of Occupancy. They may get away with this because only when you substantially renovate do you have to bring a space up to code. However, what if the law changes? For example, there is new law coming out that mandates the installation of automatic sprinkler systems. You can’t be grandfathered in if you keep rolling over a Temporary Certificate of Occupancy. Therefore, you risk having to retrofit your entire building with automatic sprinkler systems in this case. Pro Tip: Buying an Artist in Residence loft in SoHo? Beware of doing so if you aren’t a certified artist and the building doesn’t have a permanent Certificate of Occupancy. There have been instances where the NYC Department of Buildings has asked to see the artist certificates for residents in the building before agreeing to renew a Temporary Certificate of Occupancy. It’s important to carefully peruse a new construction purchase contract with your lawyer and understand that a sponsor can give you 30 days’ notice to close as soon as they have a Temporary Certificate of Occupancy and the offering plan has been declared effective. In fact, many sponsor sale contracts will include language that asks the buyer to waive their right to 30 days’ notice. As a result, it’s entirely possible that you will be closing on your new construction condo or coop purchase when the building is still rolling over its TCO. As a matter of fact, the building may continue rolling over its TCO if the tail end of construction takes a long time to close out, or if an owner pulled a permit to start their own renovations in the interim!